Abstracted vertical form appearing to be a square tube bent in two places. Title refers to old railroad cars and the switchback bays. 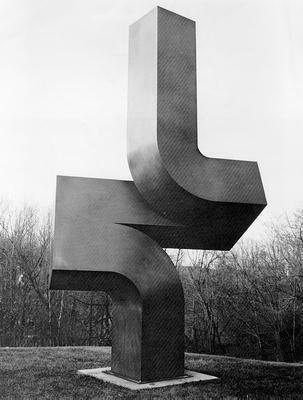 Location: 811 Madison | Previous Location: Donald Morris Inc.
: “Switchback,” Ohio Outdoor Sculpture Inventory, accessed April 22, 2019, http://oosi.sculpturecenter.org/items/show/413.